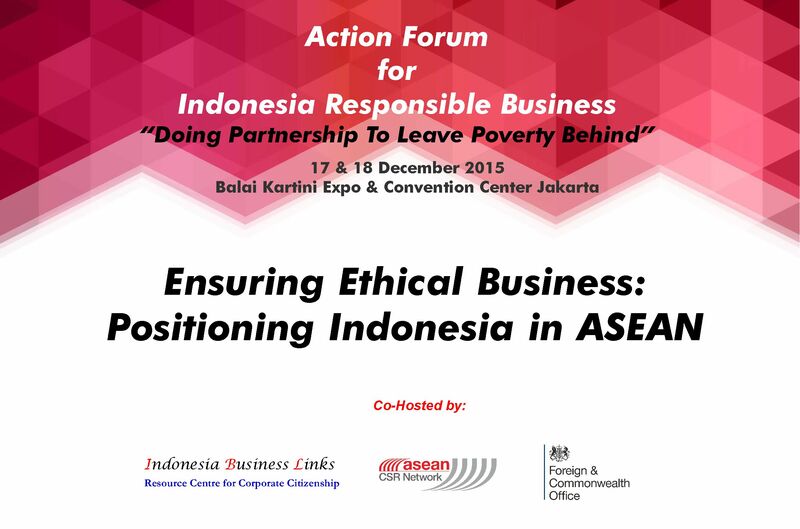 On December 17th 2015, Indonesia Business Links in collaboration with ASEAN CSR Network (ACN) successfully conducted a workshop “Ensuring Ethical Business; Positioning Indonesia in ASEAN”. This workshop was a part of IBL’s Action Forum for Responsible Business, a forum for business and other sector leaders to build a dialogue on elevating partnership for development among sectors to real actions and encouraging these in the area of ethics and transparency, disaster preparedness and youth empowerment. The workshop was attended by more than 20 out of 65 confirmed participants, professionals and leaders from both private and public sectors; a continuation of dialogue series to develop collective action among private sector on ensuring integrity and ethical business conduct in Indonesia. It was opened by Ibu Yanti Triwadiantini as the Chairperson of ACN, giving her keynote speech to show the spirit of promoting integrity and ethical business not only in Indonesia but also in ASEAN which has been promoted by ACN. The dialogue was triggered by three distinguished panelist speakers, Mr. Dadang Trisasongko as General Secretary of Transparency International Indonesia, Mrs. Elizabeth Goodbody as Partner of PricewaterhouseCoopers Indonesia, and Mr. Giri Suprapdiono as Director of Gratification of KPK. This panel discussion was moderated by Mr. Ernest Alto, VP Risk Management and Compliance of Telkom-Telstra. As the first speaker, Dadang Trisasongko shared the corruption trend in Indonesia regarding Indonesia’s CPI (Corruption Perception Index) rank in 2014 and its impact on business sector. He explained that based on TII experiences in helping PT. PLN Persero (state own electricity company, a big company in Indonesia) to create a clean working condition, there are four main pillars to uphold anti-corruption practice; participation, transparency, integrity, and accountability. He also said that Indonesia have at least three challenges to be addressed such as anti-corruption counter reform, leadership transition, and creating critical mass to support anti-corruption program. The economic growth in Indonesia is quite progressive but only few groups who feel the benefit because oligarchy system is the challenge. If we can eradicate corruption, the economic growth would increase faster. The eradication of corruption process will give significant impact not only to development but also prosperity goals. Corruption is also the symbol of political gap. The massive bribery practices experienced by companies in many provinces however caused many companies tolerated bribery as long as it secures their business and the profit margin still show good gap. Because of bribery practice in permit and license making process, consumers also have to pay the cost of it. It means consumers are unconsciously part of the one who also have to feel the burden of bribery cost. Based on survey, construction is mostly at risk of bribery, followed by mining and trade sectors. Corruption and bribery have been putting companies and organizations in unhealthy competition in getting permit and license. • Corruption is still a challenge but we can see that after many years, the eradication movement showed good impacts. Today we also have many discussion and study about corruption and transparency. • Based on survey on private sector experiences, 29 percent are asked to pay bribery and 26 percent lost to competitor because of bribery. • Be prepared for the extreme cases of corruption and bribery challenges. The last but not least, Giri Suprapdiono as the Director of Gratification of KPK also talked about KPK experiences in combatting corruption between government officials and business people, how it faced the challenges of bribery especially in mining sector. He stressed out that we used to forget that Indonesia’s CPI keeps rising and indicated that we are working on combatting corruption, comparing to other country such as Malaysia which is decreasing significantly. Indonesia is now facing different type of corruption. In New Order era, corruption was only conducted by president, his crony, and ministers. But nowadays, the actors can be your governors, mayors, parliamentary members, and even government officials. The major cases that KPK mostly faces are corruptions done by city mayors and governors. The cases are mostly related to bribery on permit and license issue. The cost of bribery often used to cover their expenses on election campaign. KPK is also working hard on how to combat bribery by warning the actors who conducted such bribery practices. This kind of problem caused private sector involving in the corruption process. What we need to do is to make private sector as a part of anti-corruption movement by using better system so that bribery cannot be used as survival system anymore. We also need to improve law enforcement and learn from successful countries such as Hongkong and Singapore in combating corruption both in public and private sectors. Indonesia Business Links (IBL) is a not-for-profit organization and it was established in the wake of the Indonesian economic crisis. A major aim of the organization is to contribute towards the creation of sound and ethical business practices in the country.